Daylilies belong to the genus Hemerocallis and are appropriately named since each bloom lasts for one day. Each plant puts out numerous blooms for 30-40 days. Daylilies are natives of the Far East, and were used for medicine and food, as well as enjoyed for their beauty. As travelers came to America, the first species brought were the orange and yellow varieties. There are now more than 75,000 hybrid daylily cultivars. Daylilies traditionally stopped growing in the winter and were dormant. Now there are evergreen and semi-evergreen varieties that bloom in warm climates year around. Daylilies are known for being tough, adaptable, and require less care than other perennials. They grow best in full sun, although will tolerate partial shade with at least 6 hours of sunlight. In the shade they will bloom about 2 weeks later, so strategically planting them can extend the bloom season. Dark color blooms are best with some shade because they absorb heat. Pink blooms need to be in full sun to get their full color. Daylilies should be planted 12-18 inches apart to allow room for growth. Soil is best if slightly acidic (pH 6.8). Daylilies do not grow well near broad leafed trees, since the tree roots use the moisture and nutrients. Daylilies also do fine near pine trees. Daylilies can tolerate being out of the ground for an extended period for shipping. Spring is best for planting in the North, and fall is best in the South. Plants may arrive limp or yellow, but will revive once planted and watered. Re-hydrate roots by soaking them in water for a few hours before planting. To plant, dig a hole larger than the plant, deep enough so that the white crown (where the roots and the foliage meet) will be one inch below surface level, spread the roots out in it, water, then cover with dirt so there are no air pockets. Once established, daylilies will produce more and larger blooms if regularly deep watered. Apply low applications of 30-10-10 granular fertilizer, dried manure, or compost in spring and after blooming season. Do not fertilize until 4 weeks after planting or in hot weather. Avoid water on the blooms because of water spots. Remove seed pods after blooming so plants are not weakened by seed production. Daylilies can be divided every three to five years in the spring or just after blooming so the plants get reestablished before winter in the North. Clumps can be dug, pulled apart, foliage cut to 6 inches and let dry overnight to let surfaces heal and prevent fungal and bacterial infections. Mulching, hoeing, or a pre-emergent seed herbicides like Preen, Treflan, or others, will control weeds. Grass herbicides such as Grass-be-gone, Fusillade or Arrow can be used anytime the grass is actively growing to spray clumps of daylily foliage to kill invading grasses without harming the daylily. 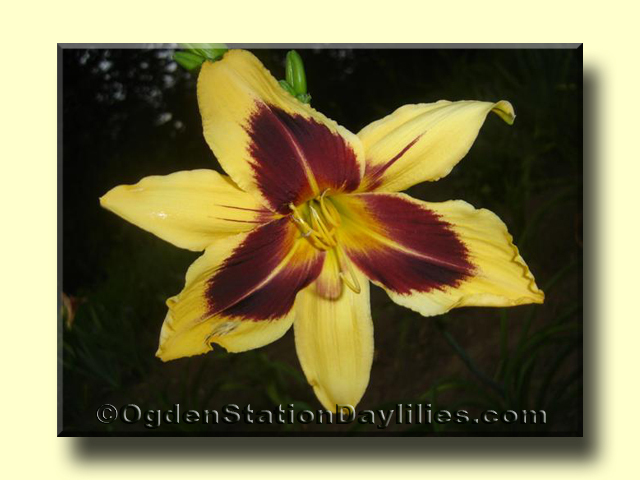 Daylilies do not generally have any disease or pest problems. If they have aphids or thrips, use a garden insecticide. Always read and follow the directions on the containers. Do not pull the old daylily foliage in the late fall because it helps hold the snow in place. Plants can be mulched for further protection with up to six inches of straw or hardwood leaves. Remove mulch and old foliage late April in the North. The winter mulch protects the plants from a January thaw where the soil can be warmed enough for the plants to come out of dormancy and begin growing, then damaged when the cold weather returns. The Chinese have eaten daylilies for centuries as first recorded during the Ming dynasty about 1500 BC. The daylily buds can be deep fried, steamed, or used in soups or casseroles. Do not overcook. Flowers can be eaten raw in salads or cooked. Buds and flowers can be frozen for later use.